A bureau of Reclamation crew installs EPDM liner to stop seepage loss for the Tulelake Irrigation District in northern California. Photo courtesy of Firestone. Technically, declining fresh water supplies could be ignored, but it wouldn’t be a wise choice on our part. The only thing that seems to be increasing about fresh water these days is the debate about what to do with it and how to best conserve it. Cities establish watering bans during hot summers. There are privatization movements and discussions around the world. New systems are established to use recycled or harvested water for lawns so that culinary/potable water supplies can be conserved. Water supplies have plummeted in the West, and this challenge, set against the protracted droughts striking Africa, Australia and other world region, should serve as a wake-up call to begin incorporating greater conservation methods into our infrastructures. A sector in which we might begin right down to the city level is the lining of canals. Professionals and agencies dealing with the use of them are often confronted with the appropriate choice of these materials yet lack an idea of the range of choices available to help them find the best solution for their project, long-term goals, and budget. A recent and stunning example of this debate from the United States concerns a plan to add at least concrete liners to earthen canals along the US – Mexico border. The $200 million plan aims to save 22 billion gallons of water per year. That is, 22 billion gallons normally lost entirely to seepage. Mexico has opposed the plan because it gains a certain amount of that water as it seeps from the canals into aquifers. Seepage is a major source of water loss in conveyance schemes. This loss could be significantly stemmed through proper lining. 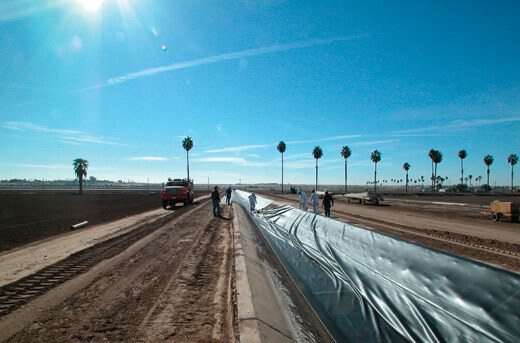 Geosynthetics—polymeric materials—present a number of materials for use in water conservation. Geomembranes and geosynthetic clay liners (GCLs) are used to protect water supplies above and below ground. These liners not only line water preservation constructions but landfills too (thus preventing pollution from seeping into clean soils and water supplies). 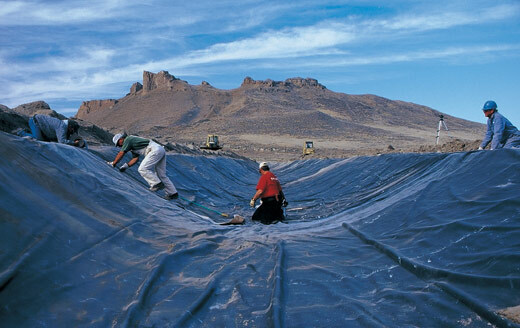 While a geosynthetic liner cannot prevent loss from evaporation—except for floating covers on, for example, reservoirs—it guards against loss due to seepage. This protection is particularly vital to the agricultural sector that so often needs canals, runoff and retention ponds and other surface water conveyance and storage solutions. Along the US – Mexico border, they’ve debated concrete panel liners. Concrete, however, is not impermeable to degradation from water flowing over it. And replacing crumbling concrete is costly and timely. This brings up another major benefit of a geosynthetic liner. When combined with a concrete system, the geosynthetic provides the same impermeable cover it would if the geosynthetic were installed over only earth while simultaneously extending the service life of a concrete installation by protecting the concrete from water degradation when installed above and subgrade erosion when installed below canals. Whether over concrete or earth, retrofit or new construction, geosynthetic liners such as HDPE and LLDPE geomembranes provide essential protection against water loss. Photo courtesy of GSE. Furthermore, liners can, decades later, be readily replaced and the concrete, still intact, can continue to function. A number of considerations need to be made when choosing geosynthetic barriers in surface water conveyance and storage schemes. And one must always keep in mind: Due diligence should always be performed and expertise sought before any material is selected for site use. As their name suggests, geosynthetic clay liners (GCLs) combine a geosynthetic with clay to create a seal for an installation. Specifically, they create a self-sealing barrier. The sodium bentonite clay swells when hydrated, so if punctures occur the bentonite can seal the break. The geosynthetic is bonded to the clay and adds its long-term shear strength and protection to the installation. The geosynthetic of a GCL is often a nonwoven geotextile. Water infrastructure applications for GCLs certainly extend beyond canals. They include dams, reservoirs and storage basins too. As for canals, an interesting resource from an arid world region is the Australian National Committee on Irrigation and Drainage (ANCID) website: www.ancid.org.au. ANCID’s online home includes a section on channel seepage management tools (http://www.ancid.org.au/seepage). A description is provided of ANCID’s experience with GCLs, including the installation of Bentofix, one of the more commonly specified GCLs, along 200 meters of a canal. High-density polyethylene (HDPE) geomembranes are the most commonly selected geosynthetic for water and waste containment. For canal lining, HDPE is perhaps best specified for new installations in which one can be assured of proper grading and compaction of the earth. HDPE, while very strong, is susceptible to stress-cracking when placed under loads for which it is not intended. (This is true of most construction materials, not just geosynthetics!) For example, differential settlement and uneven terrain can cause those strains to an installation. One might encounter these conditions more often with older canals. But with proper construction and installation practices, the HDPE geomembrane performs wonderfully and offers, additionally, excellent hydrocarbon, chemical and abrasion resistance—the very reason it’s become so popular across design segments. Linear low-density polyethylene (LLDPE) geomembranes, like HDPE materials, must be installed panel by panel by experienced technicians in the field. But LLDPE panels have greater flexibility than HDPE geomembranes so can forgive some differential settlement. LLDPE has a higher yield strain. Like HDPE, it can be used for all hydraulic applications and it offers excellent resistance to abrasion and good chemical resistance. Government agencies have shown great interest in studying the long-term benefits of using geosynthetic liners for water conveyance and storage systems--and have found them to be a smart design choice. Photo courtesy of Firestone. Polypropylene (PP) geomembranes have seen a resurgence in design in recent years as manufacturers have developed stronger formulations. PP geomembranes are flexible like LLDPE. One of PP’s differentiating points, however, regards factory seaming. Panels of it may be seamed together in the controlled environment of a factory and shipped to a site in larger sections. Fewer site seams reduces installation damage risk and makes for a faster installation. Reinforced polypropylene (RPP) geomembranes include a scrim insert, such as polyester scrim, to improve the strength of the materials. They offer excellent puncture resistance. Ethylene propylene diene monomer (EPDM) is a highly flexible and stable synthetic rubber. EPDM can conform to the shape of the earth over which it is installed (within reason—jagged earth, of course, should be corrected before installing any material). This makes it attractive for new and old installations. Also, EPDM, being so flexible, can be manufactured in large panels that can be welded together in the factory. This can produce time and cost savings for installation. It’s used widely in decorative ponds, irrigation canals, and much more. The options for canal liners are many: geosynthetic clay liners, buried PVC, geomembrane composites, and much more. Photo courtesy of Naue. Polyvinyl chloride (PVC) geomembranes are very flexible, like EPDM, and large panels of the material can be seamed together in the factory and shipped to the site, thereby making for a quick installation with strong confidence in the seams. Of note, the factory seaming of materials like PVC, EPDM and flexible polypropylene (fPP) might mean they can be installed without dewatering a canal that’s already in operation. Discuss this option with manufacturers first. PVC has been specified as liners, including as buried liners, for seepage control of concrete and earthen canals on a wide level, as well as for irrigation reservoirs. Bituminous geomembranes are not as well-known in the United States. They are heavier than most other geomembranes but are, in their way, older than many geomembranes in that early membranes involved films sandwiched within asphaltic layers. But bituminous geomembranes are growing in use and continue to refine their constructions, much in the same way other geomembrane materials are refined through research and development. The composite construction of bituminous geomembranes may involve a bituminous layer (sometimes coated and textured), a nonwoven geotextile, a glass mat, and a film (such as polyester). This wrapped construction creates a durable material with a thermal expansion coefficient of zero. It does not expand, wrinkle, contract or pull taut as other geomembranes do. Bituminous geomembranes have found acceptance and success in all major hydraulic applications but have far fewer manufacturing sources. Still, they remain an option to be explored, and the panels can be welded by locally trained personnel. Chlorosulphonated polyethylene (CSPE) geomembrane is another material that can be welded together in large panels in the factory. It uses chlorine and sulfur to soften the polyethylene structure to create this flexibility for seaming. The scrim reinforcement with the geomembranes sometimes lead them to be abbreviated as CSPE-R; but one most often finds it listed by the popular brand name, Hypalon®. The reinforcement makes it a very strong geomembrane with excellent UV exposure and long-term performance, but it has a lower elongation break; thus, it does not conform as well to rough subgrade. Ethylene interpolymer alloy (EIA) geomembranes are actually an alloy of PVC resin with a special ethylene interpolymer that creates a flexible, plastic-free material. EIA geomembranes have the advantages of PVC and a high-degree of durability and chemical resistance. This is true in relation to hydrocarbons and extreme temperatures. Membranes are typically fabricated with a high-strength reinforcing scrim. Generally, these geomembranes are used for specialty applications. You may find them also listed by a registered trademark, Elvaloy®. Polyurea (PU) geomembranes are spray-on geomembranes—a seamless barrier. They cure after application and, of course, conform well to irregular surfaces. They adhere to metals and concrete and can be formulated for many chemical resistances and temperatures of operation. 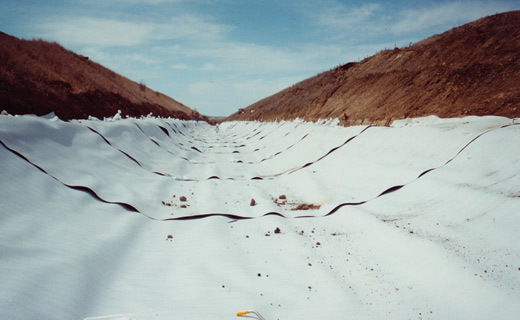 In many instances the geomembrane is sprayed onto a geotextile, such as a nonwoven. This provides a good surface on which the PU can bond. Whether sprayed onto a geotexile or directly onto a surface such as concrete, the work should always be performed by a trained professional. Some companies produce composite geomembrane materials used in lining applications. An example would be a PVC or LLDPE geomembrane sandwiched between geotextiles. The geotextiles often provide increased resistance to puncture, tear propagation, and friction related to sliding. The geotextiles are usually nonwoven materials. The overall panel tends to be heavy. Bituminous Geomembranes – Coletanche (www.coletanche.com) is one of the only global producers. An interesting diagram of the product construction is available on the Coletanche website. EIA Geomembranes – Cooley Engineered Membranes (www.cooleygroup.com) produces EIA and PP geomembranes. Other sources by which EIA may be acquired: Environmental Protection Inc. (www.geomembrane.com) and Seaman Corp. (www.xr-5.com). EPDM Geomembranes – Firestone is a major producer of EPDM geomembranes and also has a rapidly growing interest in polypropylene (PP) products: www.firestonesp.com. Also, Carlisle Syntec (www.carlislegeomembranes.com) is involved in this sector. 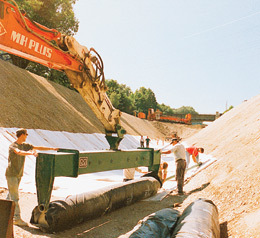 Geomembrane Composites – Huesker Inc. (www.hueskerinc.com) manufactures a geocomposite called Canal^3 that is used specifically for lining canals. It is a geombrane composite. You can find detailed information about it at the company website under the Products section. Click on “Specialty Products.” Also, Cetco (www.cetco.com) has introduced a PVC geomembrane – GCL system called Akwaguard®. Geosindex.com – This website provides free access to technical data on geomembranes, geosynthetic clay liners, and other geosynthetics. The site moderators can help answer questions on design, product acquisition, and much more. GCLs – Cetco (www.cetco.com) and Bentofix (www.bentofix.com) are the main sources for geosynthetic clay liner information and products in the United States. HDPE / LLDPE Geomembranes – Many manufacturers make both of these products and offer loads of information on their websites concerning product data, case studies, and acquisition. Some notables include Agru America (www.agruamerica.com), Atarfil (www.atarfil.com), BTL (www.bendtarp.com), GSE (www.gseworld.com), Naue (www.naue.com), and Solmax (www.solmax.com). International Association of Geosynthetic Installers (IAGI) – IAGI (www.iagi.org) is a vital link to expertise in installation. This includes certification and programs that vet both site skill/experience and financial readiness to perform work. International Commission on Irrigation and Drainage (ICID) – ICID (www.icid.org) has provided insight into irrigation and canal management for more than 60 years. Various country chapters, such as Australia’s (www.ancid.org.au/seepage/index.html) include pages addressing seepage loss control and canal lining. Polyurea Geomembranes – GSE (www.gseworld.com), Layfield (www.geomembranes.com), and Terrafix (www.terrafixgeo.com) are sources to turn to for spray-applied geomembrane information. PP Geomembranes – Companies to begin with include Cooley (www.cooleygroup.com), Firestone (www.firestonesp.com), and Raven (www.ravenind.com). 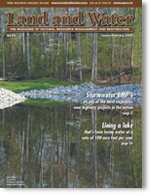 United States Bureau of Reclamation – The USBR is a chief influencer of water management approaches. They have in the past conducted canal lining tests (over many years). While some manufacturers and practitioners opposed certain ways in which the project data was acquired or analyzed, the USBR remains a good source to go to for information and studies as their personnel continues to be involved in these installations. Christopher Kelsey is a writer and editorial consultant for geosynthetica.net. He can be reached at chris@geosynthetica.net.